× StockBrokers.com helps investors like you across the globe by spending over 1,000 hours each year testing and researching online brokers. You support us through our independently chosen links, which may earn us a commission. This does not impact our completely unbiased research, which is respected by broker executives as the most thorough on the web. Thank you for your support. The StockBrokers.com annual review (9 years running) takes six months to complete and produces over 30,000 words of research each year. Industry leaders trust us because our proprietary testing methodology is completely independent and unbiased. Founded in 1985, Firstrade has a long history of providing value for its customers. 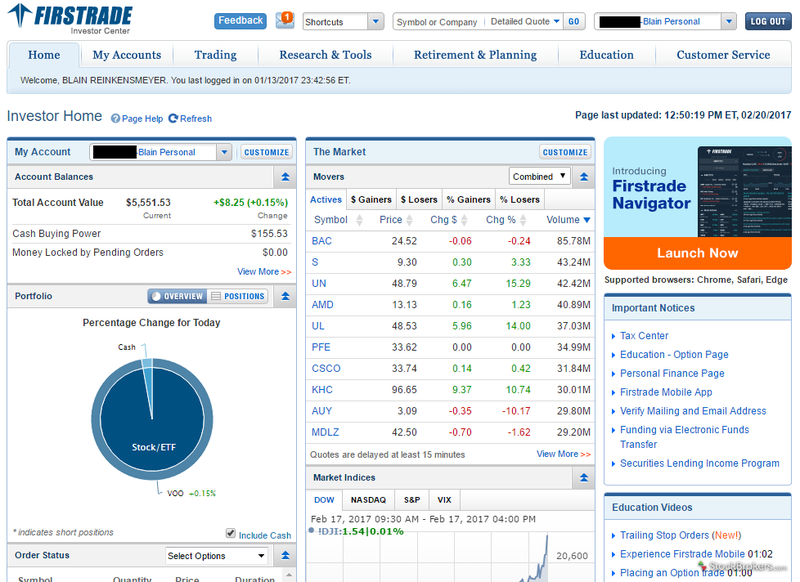 Known for its easy-to-use website, Firstrade offers $0 stock and options trading. Although Firstrade trails behind the largest brokerages, such as TD Ameritrade and Fidelity, in key areas such as research and trading tools, among others, those brokers charge more across the board. Compared to similar deep discount brokers, Firstrade provides value throughout the experience. While Firstrade lacks a feature-rich platform, the broker offers commission-free trading, maintains a clean website, and offers its customers the basics to maintain a long-term portfolio. Firstrade Navigator is only available to Premier customers. Options capabilities are hit and miss. When it comes to trades, Firstrade keep things simple, offering investors free stock, ETF, mutual fund, and options trades. Like other $0 brokers, Firstrade’s order routing relies heavily on payment for order flow (PFOF) to generate revenue. Looking at Firstrade’s closest competitors, only two do not accept PFOF: Fidelity and Merrill Edge. This means they pass along any savings back to the customer, resulting in better executions (a higher price for each share sold or a lower purchase price for each share bought). Broker-assisted phone trades cost $19.95 for stock trades and $19.95 + $.50 per contract for options trades. Bond trades are subject to a markup or markdown instead of a simplified, flat rate per bond charge. 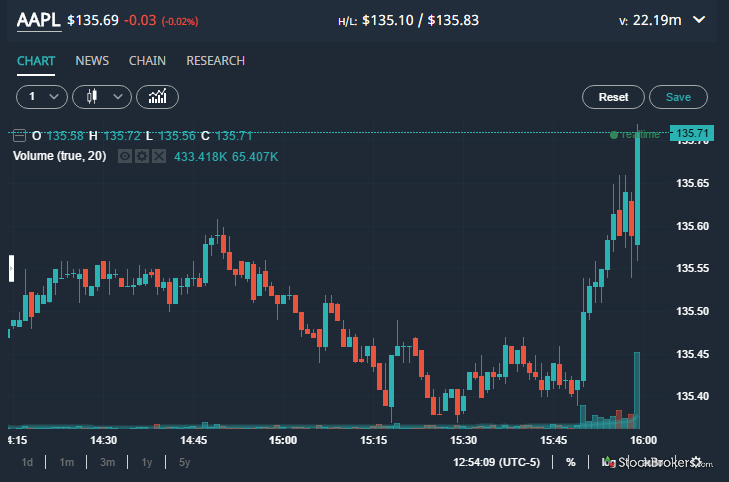 Despite requiring a $10,000 balance to unlock the Firstrade Navigator platform, Firstrade delivers a simple, easy-to-use trading experience which delivers value for its $0 trading customers. 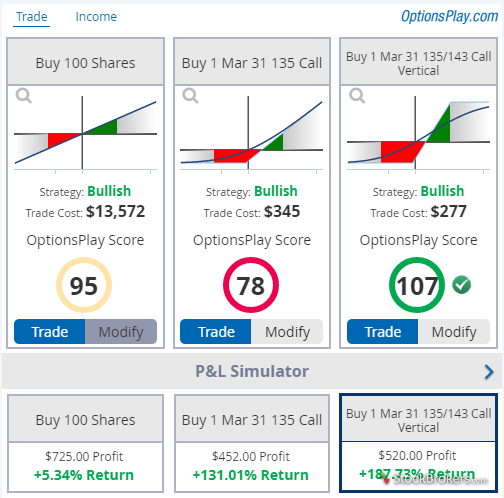 The OptionsPlay tool is excellent for options trade ideation and is provided to all customers, regardless of their account balance. 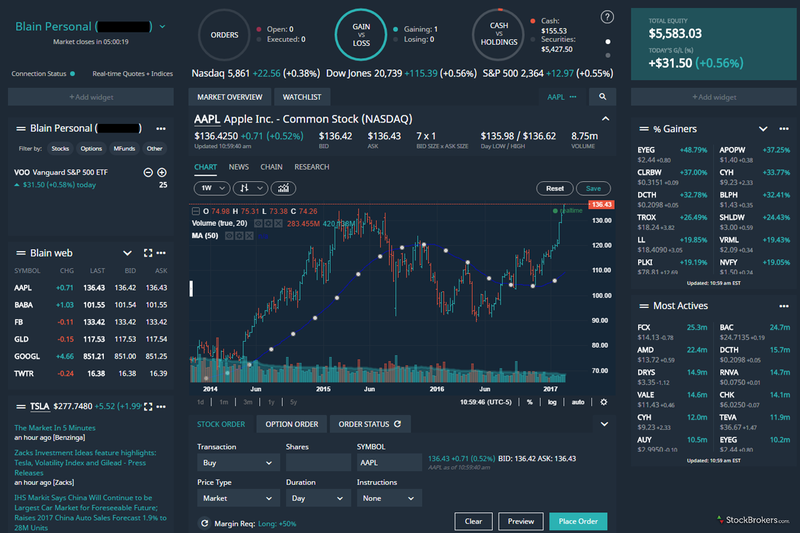 Firstrade’s web-based trading platform, Firstrade Navigator, is available only to Firstrade Premier customers, which means having an account balance of at least $10,000. Even without Premier status, however, customers can still access the platform’s streaming real-time quotes watch list through the website. The streaming watch list is easy to use; however, there are no optional fields to customize the experience. Focusing on tools and functionality alone, Firstrade, like other $0 brokers, scores poorly. Firstrade offers customers a well-balanced research experience, thanks to its use of Morningstar as its primary provider, an offering that surpasses those made by its deep discount competitors. Firstrade offers only one third-party research report for stocks, one for ETFs, and none for mutual funds. Compared to other deep discount brokers, Firstrade shines, as its competitors provide none. 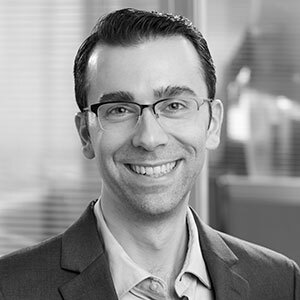 While Firstrade provides a foundation for quality research most investors will find sufficient, compared to its large (more expensive), full-service competitors, weaknesses are quite apparent. To score Customer Service, StockBrokers.com partners with customer experience research group Confero to conduct phone tests from locations throughout the United States. For our 2019 Broker Review, 300 customer service tests were conducted over ten weeks. Firstrade’s mobile apps are easy to use and met our expectations for what we would expect of a broker charging $0 for trades. Firstrade’s mobile app supports Face ID secure login and real-time streaming quotes throughout the app. Options chains and charting provide a clean experience; 19 technical studies are available for stock charts. Watch lists sync with the website. 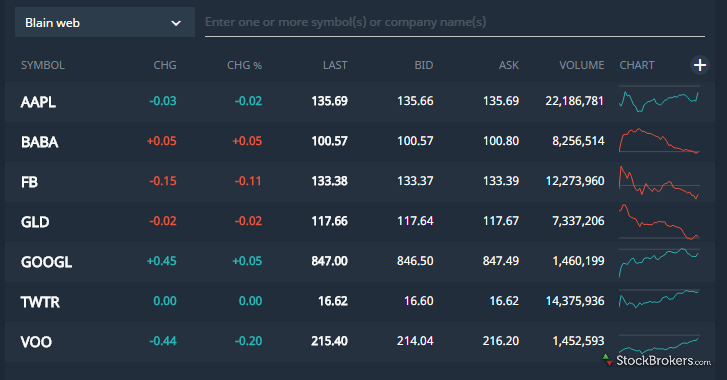 Stock charts cannot be viewed in horizontal landscape mode. Advanced order types, including complex options, are not supported. Firstrade provides a diverse offering that meets the industry standard. Stocks, ETFs, options (including complex options strategies), mutual funds, and bonds are all offered. Limited capabilities for active trading. For example, direct market routing is not offered, neither are certain advanced order types such as multi-contingent orders. Firstrade’s support for Chinese-speaking customers goes beyond 24/7 customer service. The broker also offers a fully translated customer experience, and foreign customers can easily renew their Form W-8BEN certificates entirely online through the website. While Firstrade offers a well-organized website, user-friendly tools and quality research, the broker lacks the depth to compete with the higher priced big full-service brokers. That said, investors looking for a low-cost, well balanced, all round easy-to-use broker will find Firstrade a great fit. And, for Chinese-speaking investors, Firstrade is a winner. For our 2019 Review we assessed, rated, and ranked 16 different online brokers over a period of six months. How we test. Find out how Firstrade stacks up against other brokers. Select one or more of these brokers to compare against Firstrade. All pricing data was obtained from a published web site as of 02/18/2019 and is believed to be accurate, but is not guaranteed. The StockBrokers.com staff is constantly working with its online broker representatives to obtain the latest pricing data. If you believe any data listed above is inaccurate, please contact us using the link at the bottom of this page. For stock trade rates, advertised pricing is for a standard order size of 500 shares of stock priced at $30 per share. For options orders, an options regulatory fee per contract may apply. Disclaimer: It is our organization's primary mission to provide reviews, commentary, and analysis that are unbiased and objective. While StockBrokers.com has all data verified by industry participants, it can vary from time to time. Operating as an online business, this site may be compensated through third party advertisers. Our receipt of such compensation shall not be construed as an endorsement or recommendation by StockBrokers.com, nor shall it bias our reviews, analysis, and opinions. Please see our General Disclaimers for more information.